Divine Shield. Taunt. Deathrattle: Equip a 5/3 Ashbringer. If you haven't heard the Tirion Fordring theme song, it's because it doesn't exist. Tirion Fordring is a legendary paladin minion card, from the Classic set. His Deathrattle equips the controlling hero with Ashbringer. 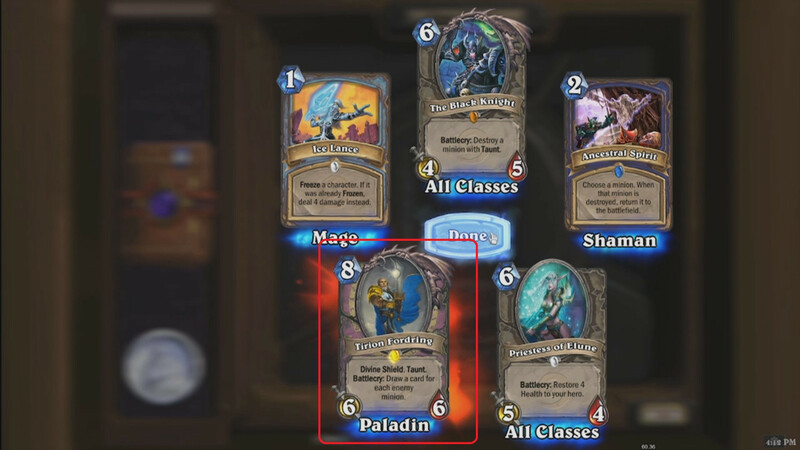 Tirion Fordring can be obtained through Classic card packs, through crafting, or as an Arena reward. Tirion Fordring is an 8 mana, 6/6 minion with 3 abilities: Divine Shield, Taunt and Deathrattle. Although Tirion's stats are below par for his mana cost, his abilities make him a powerful card for any paladin deck. Not only can Tirion shield himself from one attack with Divine Shield, he also forces the enemy to attack him due to his Taunt. If Tirion does die, he leaves a lasting mark on the game with his Deathrattle ability, which equips Ashbringer, a 5 attack, 3 durability weapon for your paladin. This weapon alone can deal 15 damage to your opponent over the course of 3 turns, and is in itself a decent reason to play Tirion. In the best-case scenario, Tirion will absorb two or more enemy minion attacks before granting the paladin the ability to take out more with the Ashbringer. The one thing to be aware of when playing him - and one effective way to counter him - is through either a Silence or a Transform effect. These will prevent his Deathrattle from activating, and also strip him of his other abilities. Playing a weapon destroying card such as Acidic Swamp Ooze or Harrison Jones after killing Tirion, while it won't remove his Divine Shield and Taunt, is also an effective counter. Put your faith in the Light! Highlord Tirion Fordring is the Supreme Commander of the Argent Crusade and the current bearer of the Ashbringer. One of the first five Knights of the Silver Hand selected by Archbishop Alonsus Faol, Fordring was one of the heroes of the Second War. He later became Lord of Mardenholde Keep in Hearthglen before being stripped of his title and exiled for defending an orc, Eitrigg, with whom he remains good friends to this day. Following the death of his son Taelan, Tirion committed himself to refounding the order of the Silver Hand. The result was the Argent Crusade, an organization consisting of the old Knights of the Silver Hand and the Argent Dawn. Tirion led his new Crusade into battle against the Scourge during the invasion of Northrend and, aided by Highlord Darion Mograine and his Knights of the Ebon Blade, directed the successful assault against Icecrown Citadel which resulted in the death of the Lich King. After the victory in Northrend, Fordring has returned to Hearthglen and directs the Crusade as it works to revitalize the Plaguelands. Tirion Fordring was the only living person in Azeroth with the purity and power to cleanse the Corrupted Ashbringer, thus reverting it back to its purified state. Fordring then became the Ashbringer's third wielder (Following Alexandros and Darion Mograine), and used the weapon in the war against the Scourge, and ultimately used it to defeat Arthas Menethil, the Lich King, and destroy Frostmourne. Rising from the ranks of a knight and later a paladin, Tirion Fordring was a man of honor — and his commitment to upholding his honor no matter the cost often brought him into conflict with his family and friends. His wife Karandra Fordring often lamented the sacrifices she had to make in order to adapt to her husband's tendency to place his personal honor above everything else - his family included. So, for instance, when Fordring attempted to explain to his wife and to his long-time friend Arden that his commitment to saving the life of Eitrigg was a matter of honor, he encountered, for the most part, a total lack of understanding, with both Arden and Karandra arguing that he also has a responsibility to his family and his subjects — a responsibility he should not neglect in the name of honor. Tirion's honor, therefore, was the ultimate cause of his downfall — during his trial, he was offered an opportunity to be restored to good standing within the Alliance if only he would renounce the vow he gave to Eitrigg. Tirion refused, saying that his honor precluded him from doing so. In the end, Tirion Fordring paid heavily for the honor he held in such high esteem. Not only was he stripped of his office and estates, but his family — Karandra Fordring and Taelan — refused to accompany him into exile, his wife stating that she would not let him ruin their lives as he had ruined his own. Thus, after his rescue of Eitrigg from the gallows in Stratholme, honor was very much the only thing Tirion still had. After his exile and the fall of Lordaeron to the Scourge, Tirion fell into inactivity, feeling there was no reason for him to fight. That all changed, however, with the death of Taelan. Filled with righteous anger at the loss of his beloved son, Tirion vowed to reestablish the Knights of the Silver Hand, to oppose the spread of evil in the world. The artwork for this card comes from the World of Warcraft Trading Card Game "Wrathgate" series, for the card Highlord Tirion Fordring. Tirion Fordring's entrance music is taken from A Call to Arms. This sting is shared with Archmage Antonidas. Patch 1.0.0.3140 (April or May 2013): Text changed from "Divine Shield. Taunt. Battlecry: Draw a card for each enemy minion." to "Divine Shield. Taunt. Deathrattle: Equip a 5/3 Ashbringer.". This page was last edited on 24 November 2018, at 18:57.